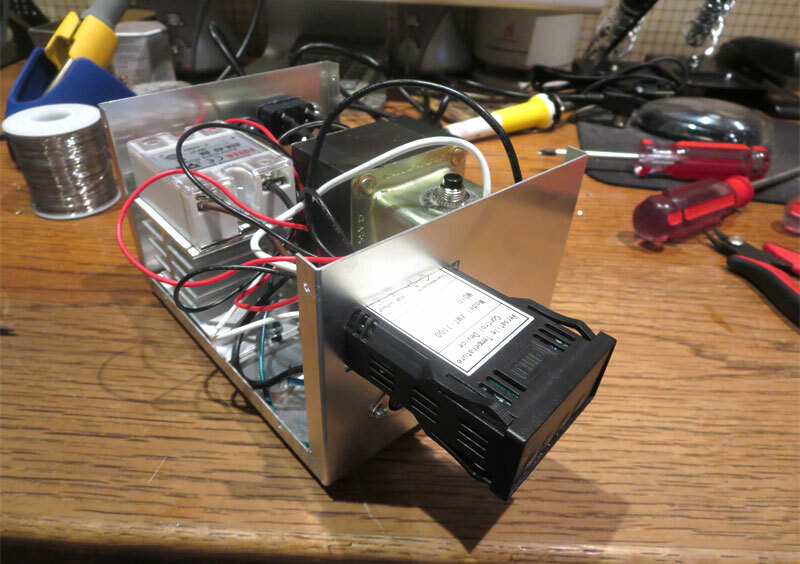 The unit uses a PID temperature controller, an SSR (Solid State Relay) and a transformer plus a metal enclosure case, a soldering stand and a few other parts. 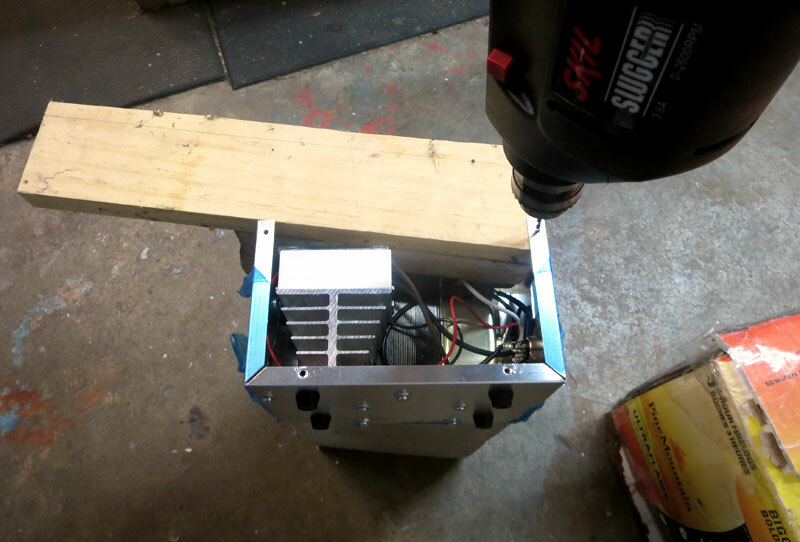 It is relatively inexpensive to build, plus it makes a pretty good shop tool. 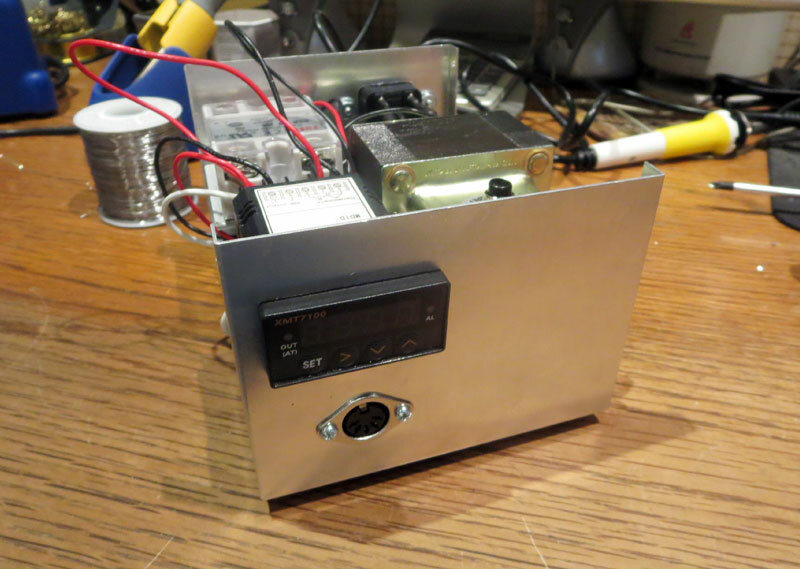 This homemade unit is not as responsive as one of the commercially manufactured ones like a Weller or a Hakko, but it works surprisingly good. 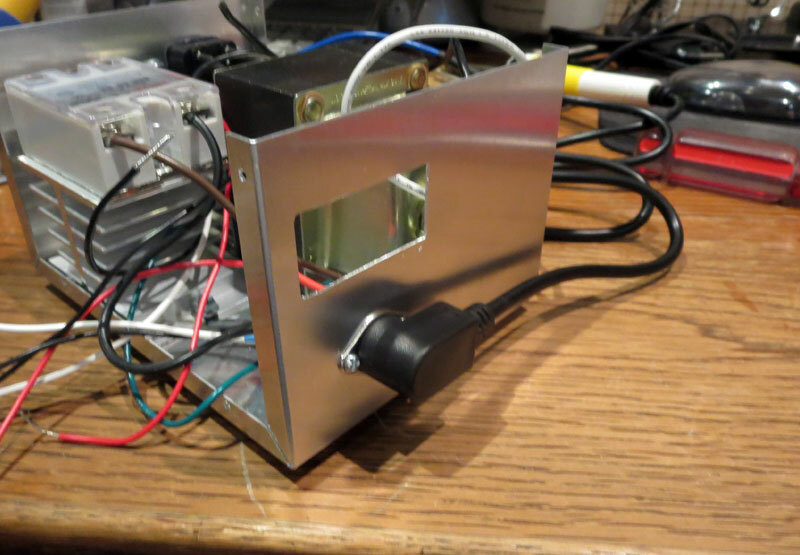 The PID controller was designed primarily for manufacturing process control, but it was easy enough to adapt it for use in a soldering station. Accompanying this post is a series of videos showing how to optimize the PID controller and get the best performance from it. 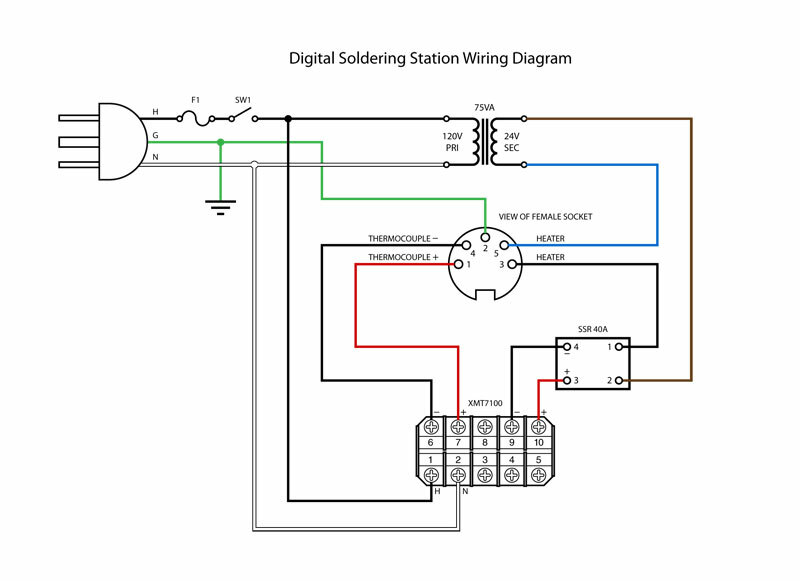 Below is a wiring diagram for the unit. The usual cautions apply here so please pay attention. WARNING!! – DO NOT ATTEMPT to construct this circuit unless you know what you are doing! If you are not absolutely sure you know what you are doing, then get someone to help you who does. There exists a possible danger of electric shock WHICH CAN BE FATAL. If you decide to construct this circuit or work with it, you do so at your own risk! 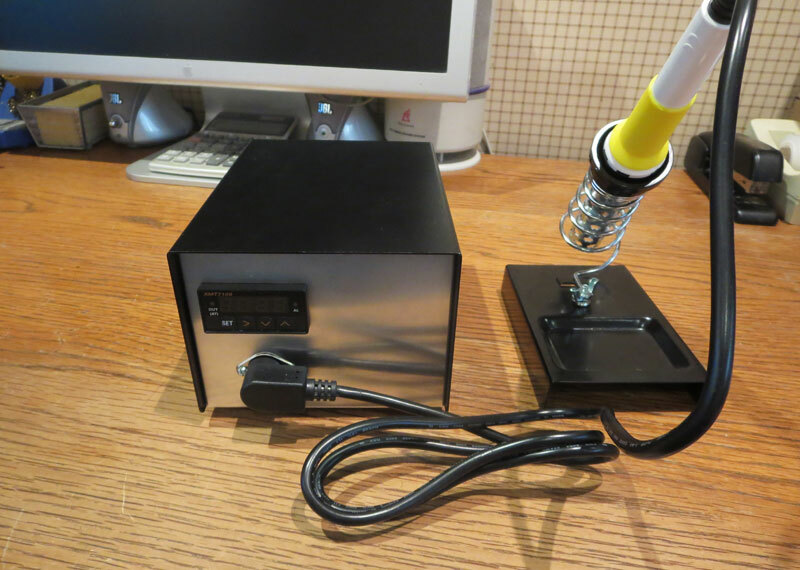 The soldering iron I chose was a Solomon replacement iron for an SL-30 soldering station. 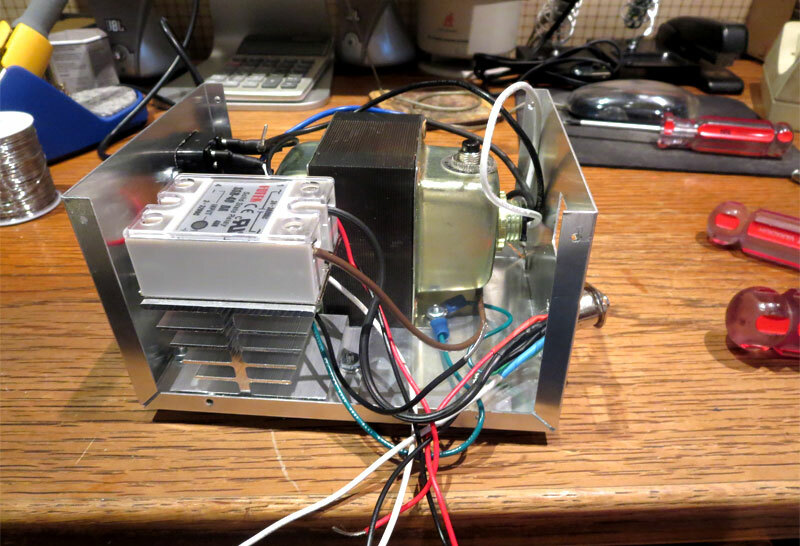 It is a 24 volt, 48 watt unit with a K-type thermocouple sensor. The PID controller is compatible with some PTC (Positive Thermal Coefficient) type RTD (Resistance Temperature Detector) sensors such as a PT10 or PT100. But to my knowlege the only compatible soldering irons available for this type of PID controller must use a K-type thermocouple sensor. Other soldering irons that may also be compatible are available under the brand names Elenco (600010), Pensol (IRON-N), Tenma (21-7936) and Ningbo Zhongdi (ZD-929C). I have not checked any of these so I cannot personally vouch for them, but I only mention them to provide some alternative choices. The first thing I did was to establish the connector type and pin assignments for the connector. The Solomon unit uses a 5 pin DIN, 180 degree connector. 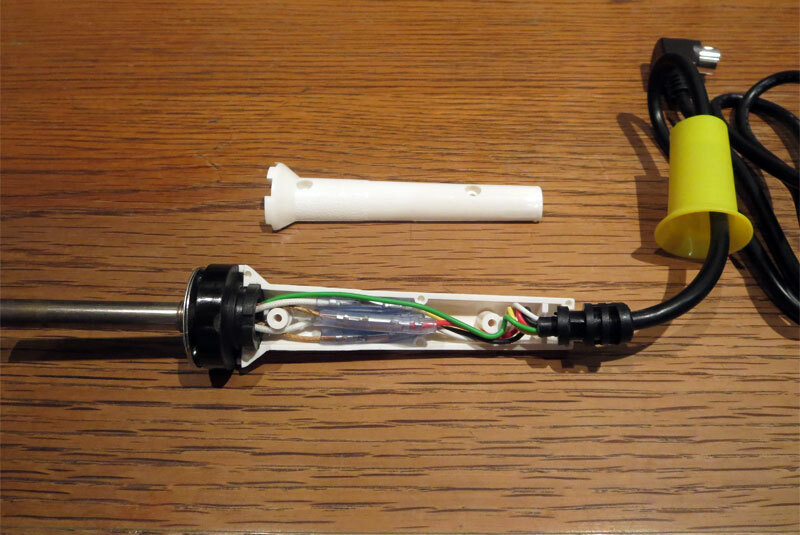 I removed two screws on the soldering iron handle to partially disassemble the unit. I checked the continuity between the connector pins and each wire. It uses a 5-conductor cable. Even though there are online references for the pin assignments, it was easy enough to check and I had to be absolutely sure. The wire colors were red (pin 1), black (pin 4), green (pin 2), yellow (pin 5) and white (pin 3). The red and black wires were for the thermocouple positive and negative conductors, the white and yellow wires were for the heating unit and the green wire was grounded to a metal plate on the soldering iron. This was the first time I ever worked with a PID temperature controller. I needed to get familiar with how to use it so I setup a basic test board. This first test board was even made a few days before a previous post on a using a modified soldering iron with a dual display PID controller. 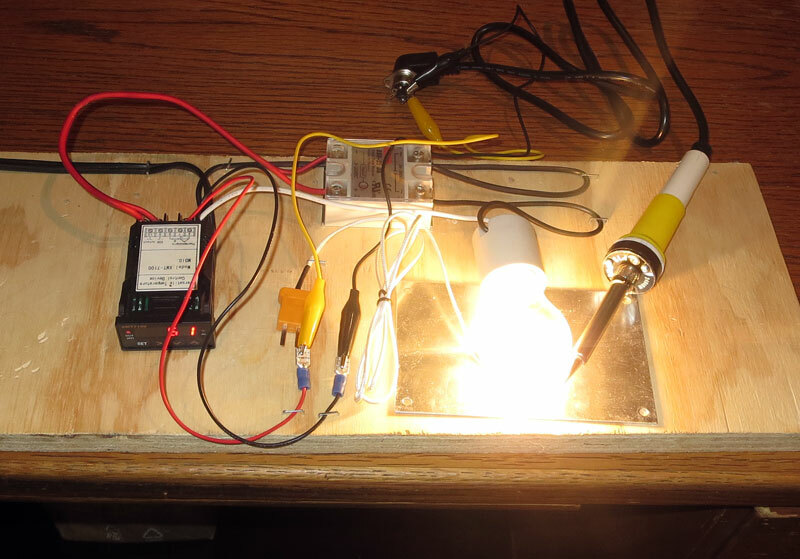 For this first test I connected a 120 volt light bulb as the heating unit, a one meter K-type thermocouple placed up against the light bulb and a 25 amp SSR to switch the light bulb on and off. I played around with the settings and it switched the bulb on and off according to the temperature no problem. Next, I wanted to see how the unit worked with the soldering iron thermocouple sensor. I disconnected the thermocouple from the previous test and connected the soldering iron to a 5 pin DIN socket. I placed the tip of the soldering iron up against the light bulb so the heat from the light bulb would heat up the sensor. Then I connected the sensor pins on the socket to the PID controller with alligator leads. When the light bulb heated up the change in temperature registered on the PID controller display. So far so good. 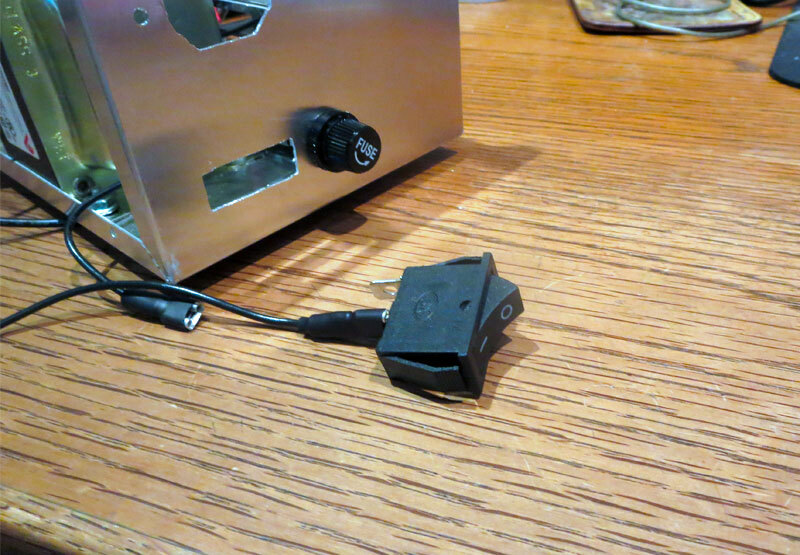 The next test was to find a 24 volt transformer to power the soldering iron. Below is a photo of the test board. The first couple of transformers I tried were not adequate. I settled on a 75VA unit from Veris (model number X075CAA shown below in the photo). I continued to use the 25 amp SSR up to a point until I found some online references on coupling an SSR to a transformer. The references alerted me to the fact that in this configuration the SSR may experience some current inrush during switching. 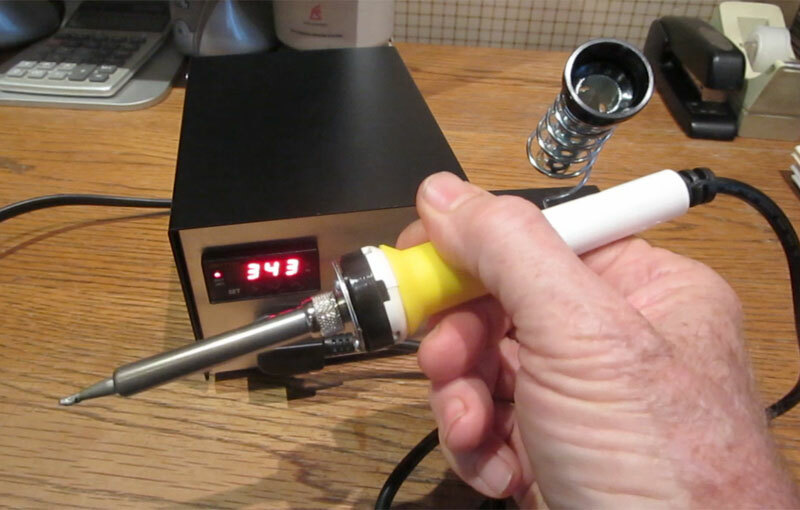 The situation could even be exacerbated if the soldering iron had a ceramic heating element. There was the possibility that using a 25 amp SSR might lead to its premature failure. I didn’t want to experience a sudden SSR failure so I decided to bump up the SSR capacity to 40 amps for a little more headroom. 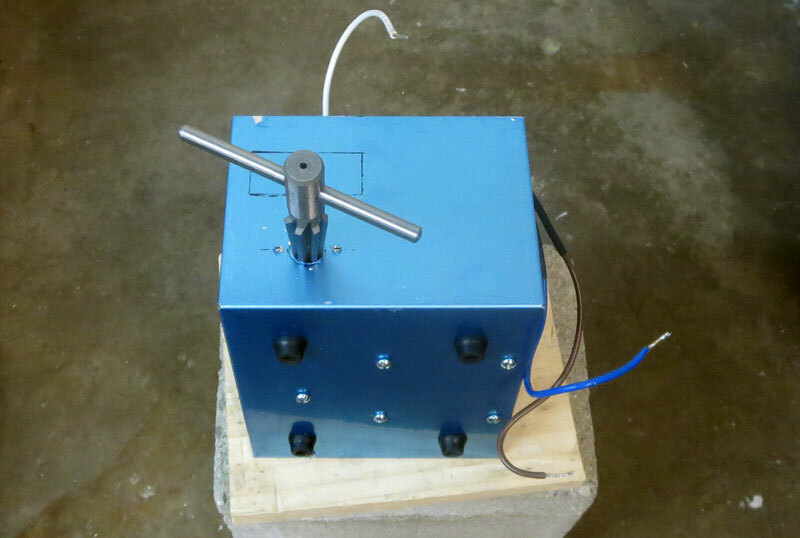 The goal of the testing was first to make sure that the secondary voltage from the transformer did not exceed 24 volts under load. Coming in over 24 volts could lead to premature failure of the soldering iron. When I checked it unloaded it was at 26.1 to 26.2 volts. 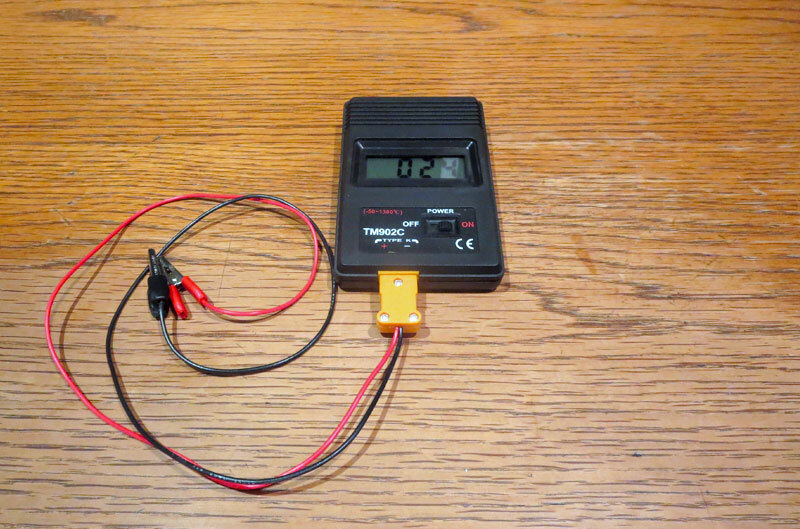 I connected a multimeter to the transformer secondary leads on the test board. Here in the photo below you can see that the voltage was coming in under 24 volts when under load from the soldering iron. This is was what I wanted. The SSR specification has a voltage drop of 1.6 volts so it contributed to lowering the voltage. In my case I believe it was more like 1.2 volts. 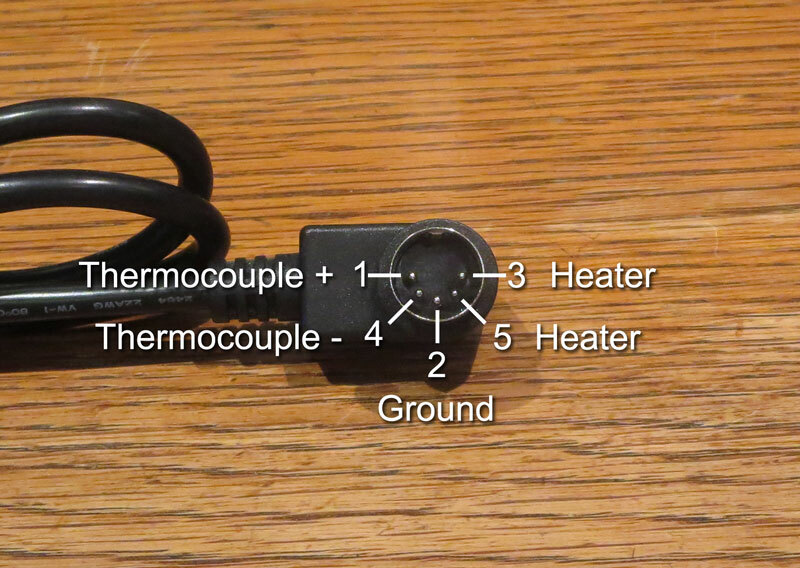 I was also checking the temperature of the soldering iron on a tip thermometer. 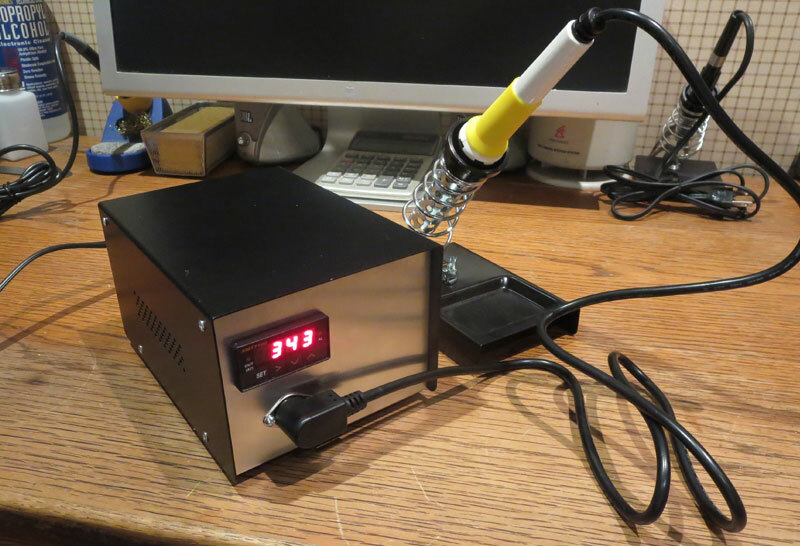 When the temperature reached the set value (SV), the soldering iron temperature would be less than the PID controller. 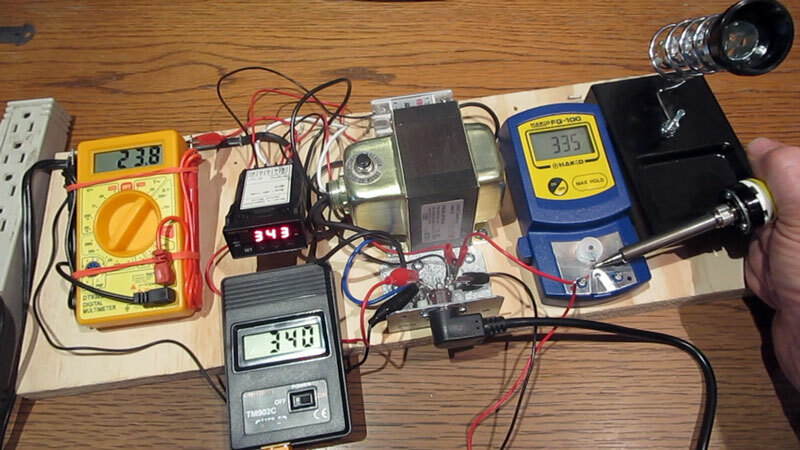 In this photo, for example, the PID controller was displaying 341 degrees, but the soldering iron was 334 degrees. I wanted to check to see if the difference was caused by the controller or the soldering iron so I setup one more test. 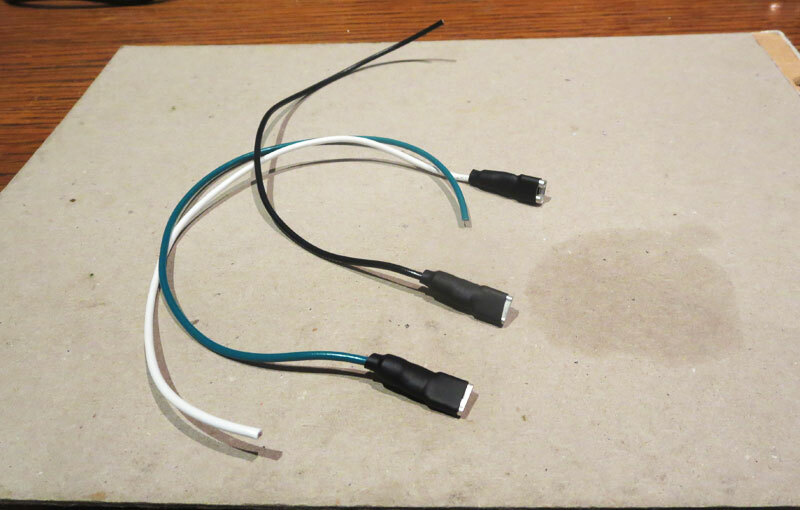 I made a set of alligator test leads for my digital thermometer. The leads would be clipped to the thermocouple sensor pins on the DIN socket. 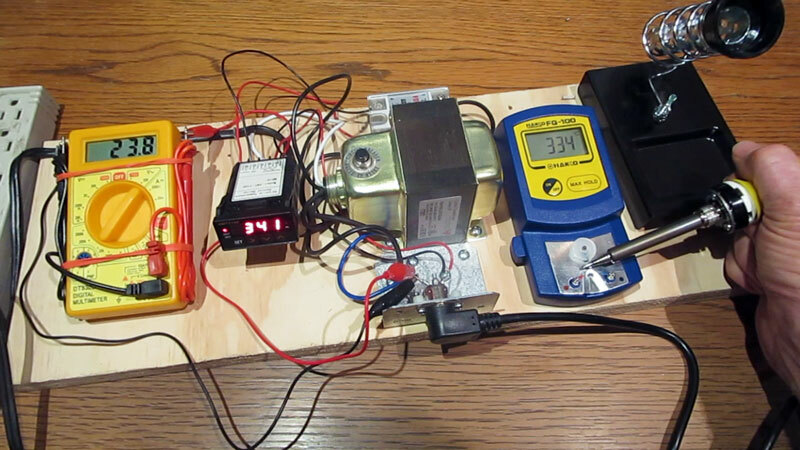 The test showed that the difference was coming from the soldering iron and not the PID controller. The PID controller reading lagged a little behind the thermometer reading while the temperature was fluctuating, but it was pretty much the same once the temperature settled. For example, the temperature on the PID controller would be less than the thermometer when the temperature was rising, and would be more than the thermometer when the temperature was falling. I found a setting in the PID controller to offset the difference in temperature. This was the last test before building the unit. With testing complete, the unit was ready to build. Most of the parts are shown in the video below and the following table lists each part along with suppliers and links. The first thing is to layout the arrangement of the big parts in the enclosure. The photo below shows paper cutouts taped to the underside of the the plastic wrapper on the enclosure. Please note: There not only has to be enough room for all the parts but also there must be room for the rubber feet screws. Notice the four screw holes in the photo below. Two of them lie under parts that mount directly to the case bottom (the transformer and the SSR heat sink). These had to be checked for clearance and, as it turned out, there was room. I took measurements and made sketches for the layouts of the panel cutouts for the front and rear. I used an ultra fine felt tip marker to draw the locations of the cutouts on the panels. Shown below is the front panel. 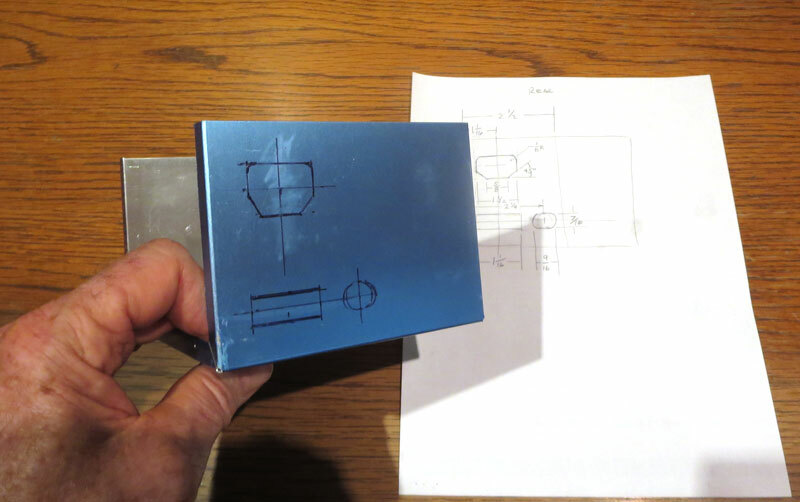 The aluminum sheet metal came with a translucent blue plastic covering to protect the finish. The photo below shows the rear panel layout. Take care to make accurate measurements of the openings. You want all the parts to be close fitting. 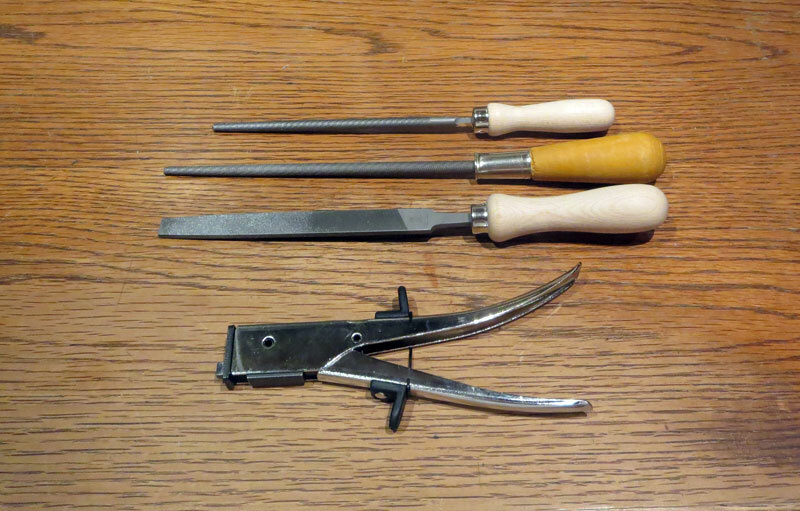 Shown below are a few of the hand tools used to make the cutouts – a couple of round files, a flat file and a nibbler. A power drill and an assortment of drill bits were used to drill the holes. In the photo below one of the round files was used to elongate the hole for the fuse holder. The photo below shows the front panel. A taper reamer was used to enlarge the hole for the DIN socket. The rubber feet were mounted. The transformer plus the SSR heat and sink were also mounted using #6-32 x 3/8 inch pan head Phillips machine screws, hex nuts and washers. The finished panel cutouts are shown in the photo below. 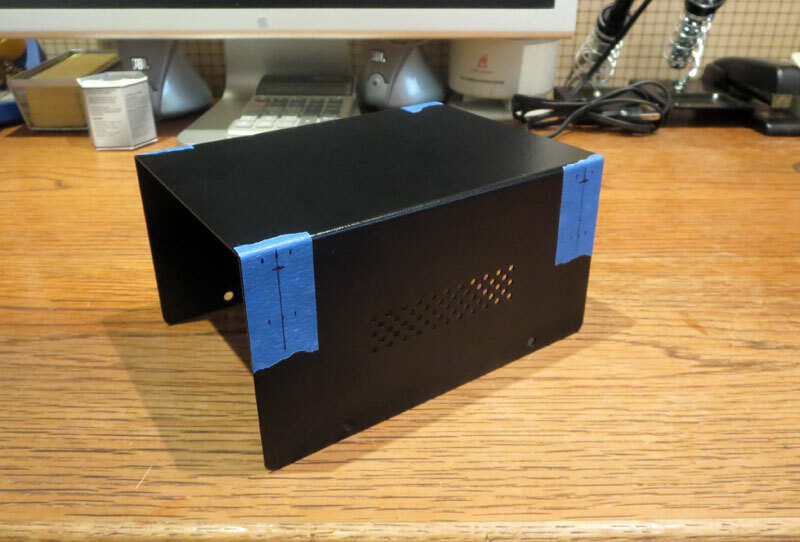 The enclosure case needed to be braced with extra screws to keep the end panels from flexing when plugging in the power cord or pressing the controller buttons. Markings for hole locations were made on pieces of masking tape affixed to the side panels. Holes were drilled with a power drill. Note that the protective plastic covering was completely peeled off the bottom plus a little bit off the sides in preparation for final assembly. The upper case holes were countersunk and the top and bottom halves joined to check hole alignment. 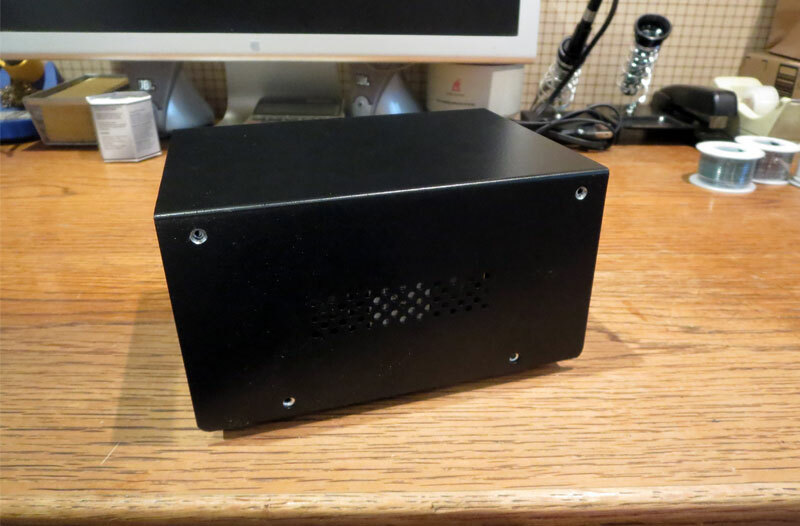 Another view of the enclosure case. All the protective plastic covering has been removed and the unit is ready for final assembly. 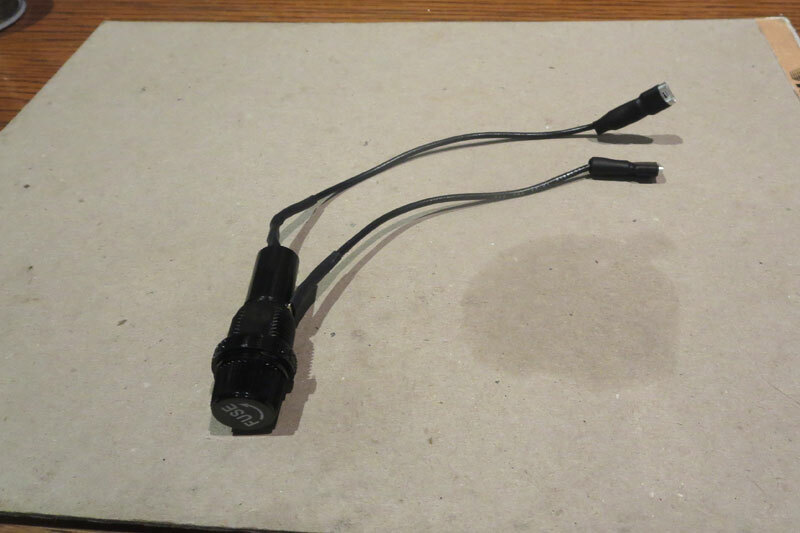 Leads were soldered to the fuse holder (shown below). Flat crimp terminals were attached to the ends of the leads and heat shrink tubing was applied to all exposed connections. One of the flat terminals connects to the IEC power receptacle and the other connects to the switch. 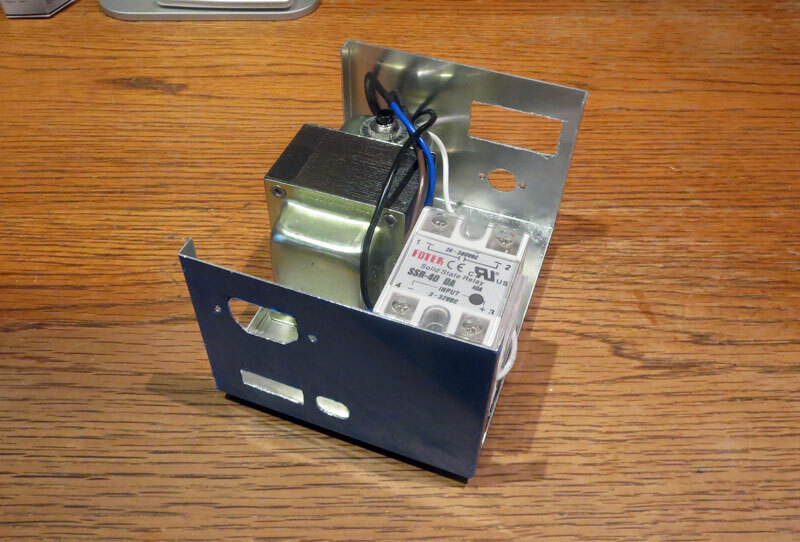 Leads were prepared for the IEC power receptacle and switch. Flat crimp terminals were attached to the ends. Heat shrink tubing was applied to minimize the exposed connectors. A ring terminal would be crimped onto the end of the green wire that would be fastened to the chassis. 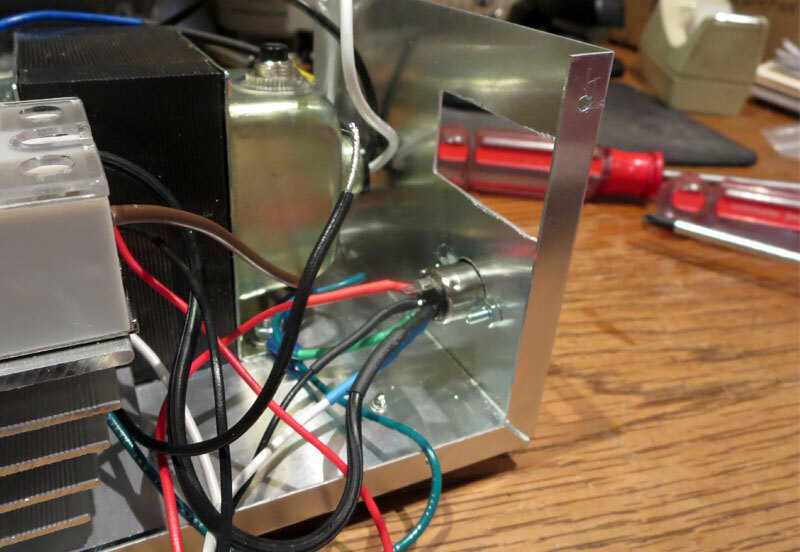 The bare ends of the black and white wires connect to the PID controller. Leads were soldered to the DIN socket and heat shrink tubing was applied to all exposed connections. A ring terminal would be crimped onto the end of the green wire that would be fastened to the chassis. The heavy black wire connects to one of the high voltage terminals on the SSR. The red wire and remaining black wire connect to terminals on the PID controller. The white wire with the blue heat shrink tubing will be connected to the blue secondary wire on the transformer with a wire nut. 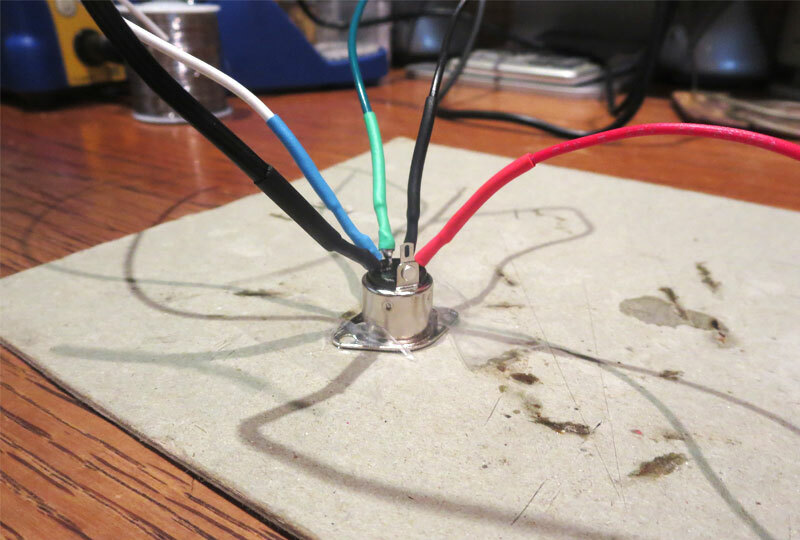 Using a wire nut for this last connection allows all the soldering to the DIN socket to be done on the bench top and not in a tight space inside the assembly. The fuse holder was mounted to the rear panel first because it was located in a tight space and access was required to tighten the nut. I am using a 2 amp fuse. So far it hasn’t blown, but I haven’t tried it at maximum heat, yet, either. The lead that was prepared in a previous step was connected to the switch. The switch was mounted, followed by the IEC power receptacle using #6-32 x 3/8 inch pan head Phillips machine screws, hex nuts and washers. I had to bend the crimp terminals on the swtch to allow some clearance from the transformer. The photo below shows the rear panel components mounted. 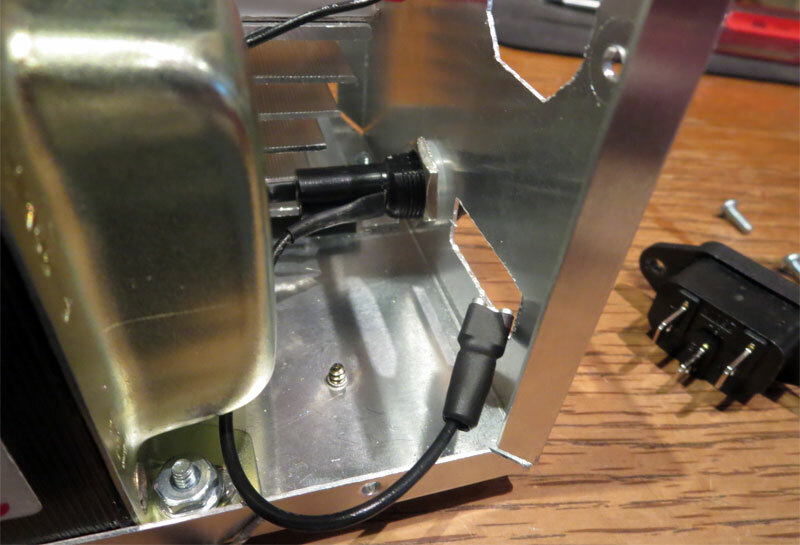 The DIN socket is inserted into the mounting hole in the front panel and the green grounding wires from the IEC power receptacle and the DIN socket are atttached to the chassis using one of the transformer foot mounting screws (click photo to enlarge). The DIN socket was mounted using #4-40 x 3/8 inch pan head Phillips machine screws, hex nuts and washers. The soldering iron connector was plugged in and checked to make sure there was enough clearance between the screw heads. 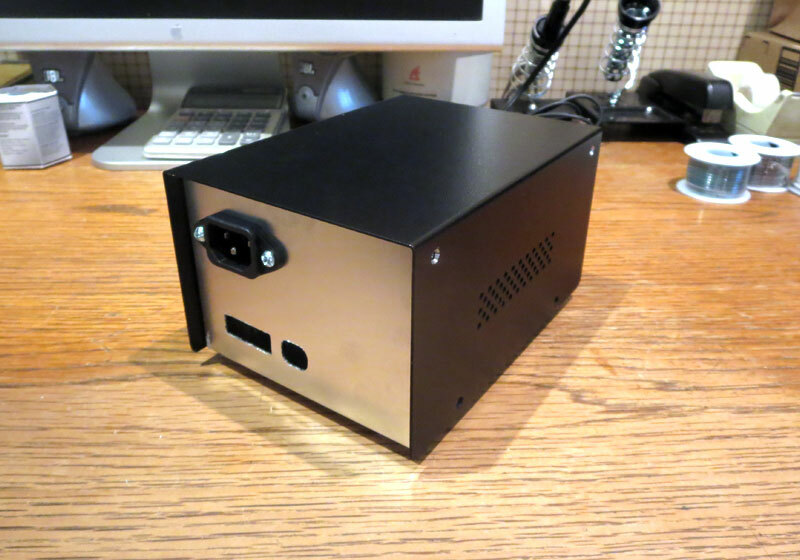 The photo below is a rear view showing the DIN socket mounting. 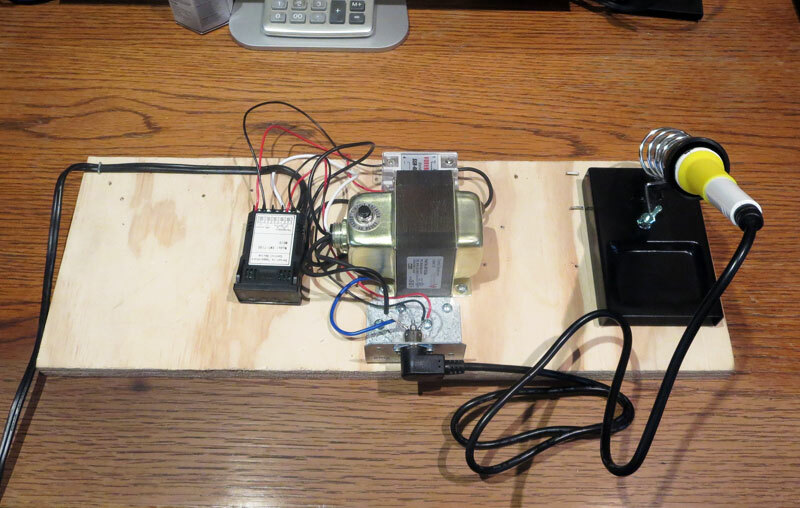 The PID controller is the final component to be mounted. 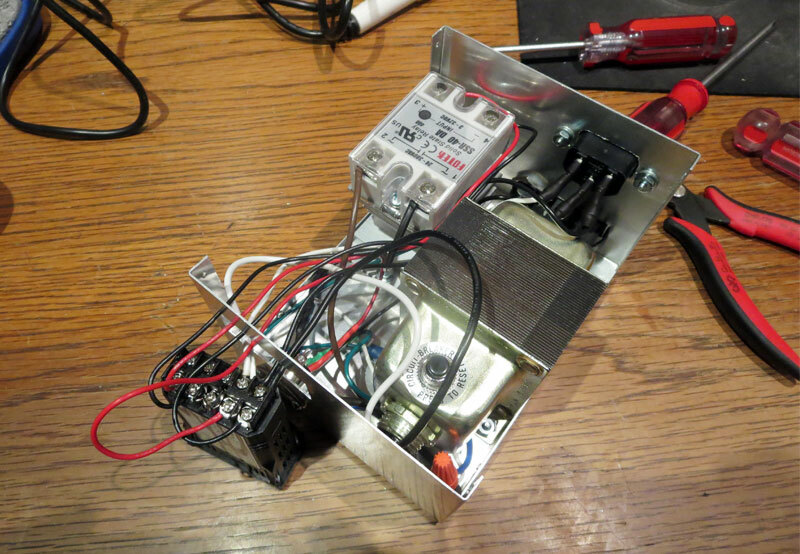 The remaining wiring was threaded through the front panel cutout and connected to the PID controller terminals according to the wiring diagram. Please note the orange wire nut next to the transformer. This wire nut joins one of the secondary leads to the white lead from pin number 5 on the DIN socket. 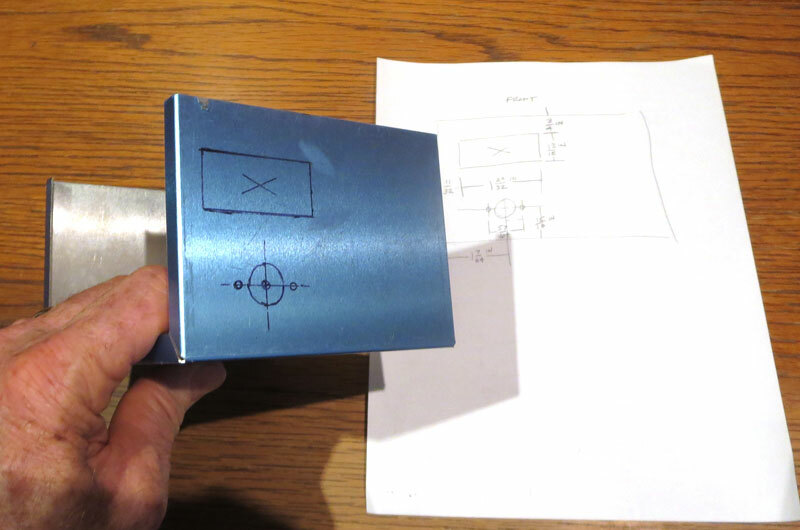 The PID controller is inserted into the front panel cutout. The PID controller is pushed all the way into the panel cutout and snaps into position by means of clips molded into the plastic case. 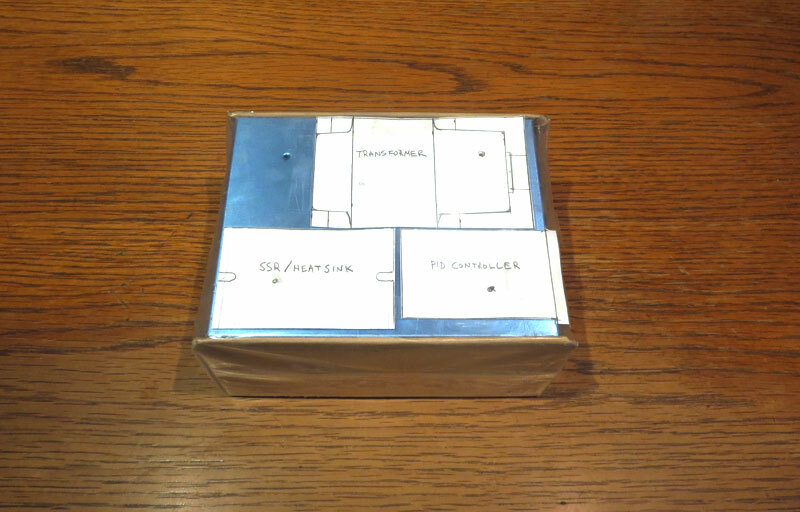 Shown below is the completed unit ready to use with accompanying soldering stand. I have had the opportunity to use the unit in normal daily operation. I was able to use it without a second thought and it worked like a charm. I replaced the conical tip with a 1/16th inch chisel tip on the soldering iron and I like the way it works. 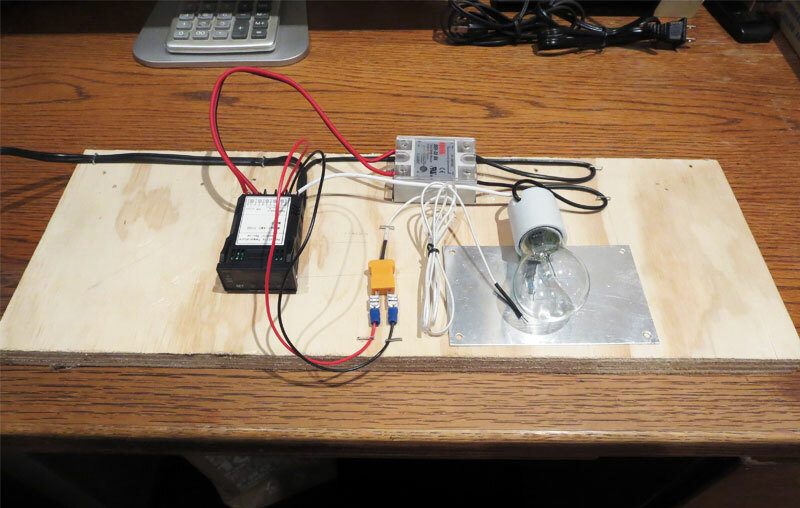 This is a good do it yourself electronics project. It is simple to do, fairly inexpensive and makes a great shop tool! It looks like nice exercise. But I don’t see any real life application or better need for it. Solomon alike stations are quite cheap a adding up your BOM it is 100 USD pretty quickly. And working in this exact pencil for couple years in the past I can declare that it is horrible. I don’t know but when building soldering station the DIY way I would go for top notch, so basically Metcal or JBC handles. There are how-tos publicized on internet. Awesome post! Its really cool to find a nice clean design for a station like you’ve done here. My problem in Australia is if i got all the parts together individually i think the cost would blow way over what you might pay an ok one in the first place. I wonder if you could buy a 936 fake for cheap and use what bits you can off it to adapt these ideas? I understand that the cost can be a problem. 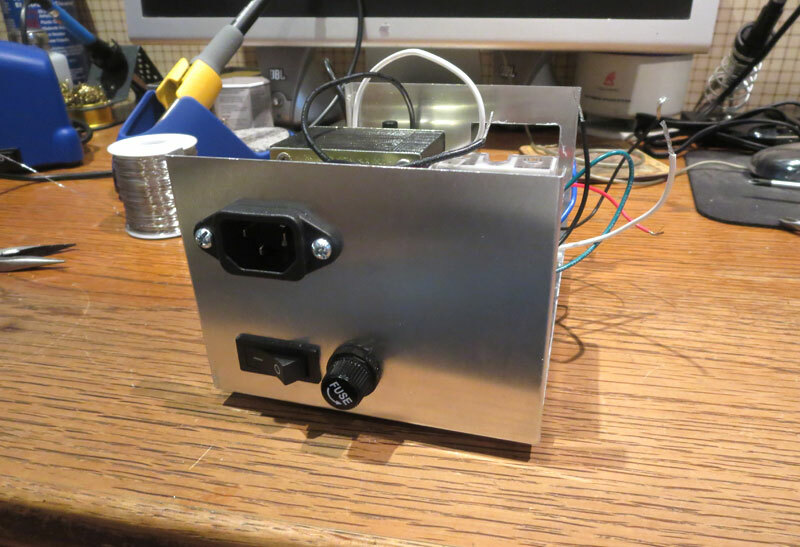 You might want to look at the post for the DIY 110v Temperature Controlled Soldering Station at this link: https://pcbsmoke.wordpress.com/2015/10/03/diy-110v-temperature-controlled-soldering-station/ This was made for quite a bit less. I realize it’s not 24v, but at least it’s cheaper to build. The idea to use a fake 936 for a starting point is good but the 936 controller won’t work with the Solomon soldering iron. The 936 controller works with a 907 iron. 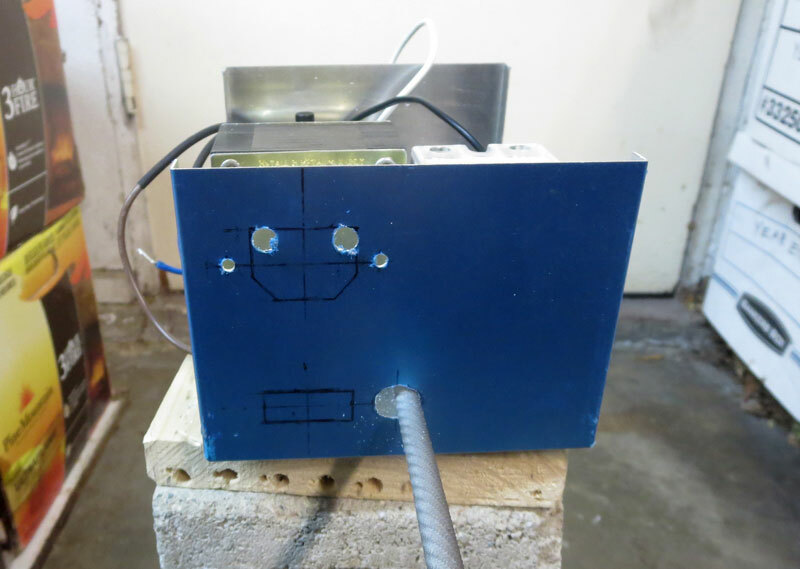 That iron uses a PTC sensor and the Solomon iron has a thermocouple sensor. It’s not that cost is a problem, it’s that this is a poor result for an extreme price for what it is. The soldering wands themselves are junk, as are the tips for them, then add all the labor and the result is truly terrible. I realize this is two years after the fact so the price probably dropped on what I suggest, but that suggestion is get a Yihua 939D off eBay for ~ $30. 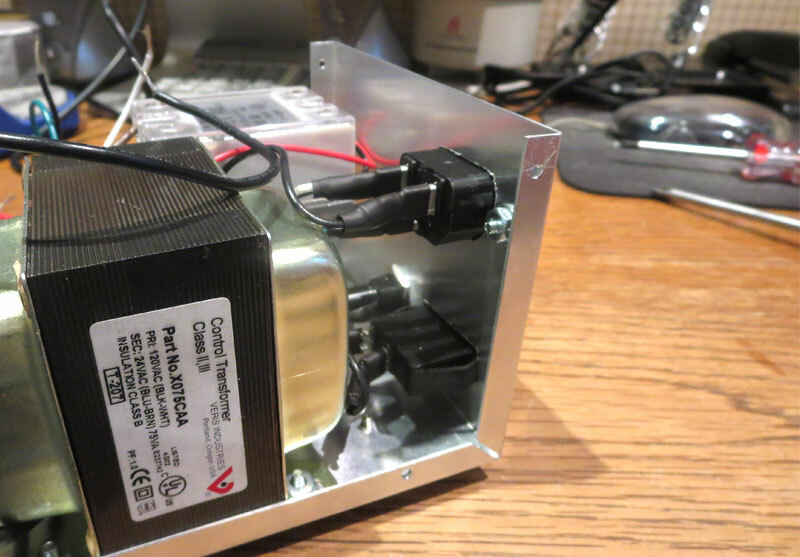 It’s 24VDC, grounded/ESD safe, around 60W (claims 75W to 80W), digital, and takes Hakko tips. Can use Hakko irons too if you rewire the Hakko with a female plug instead of male. If you’re spending closer to $85, just get a Hakko or Weller, both brands have entry level ~ 24VDC stations around that price point on sale. Very cool project, very professional look! will have to try making my own someday!